The Minnesota Wild set records for wins and points last season, and yet they surely look back on the season with disgust. They went into a manageable first-round playoff series against St. Louis, and they were sent off to the golf course after just five games. Their goaltending was sound in the playoffs, but they only scored 10 goals in five games, they lost three home games, and they frankly weren't good enough. It was a waste of a very good season. They responded by juggling quite a few players around, but they stuck primarily with the same core that got them to where they got last year. This falling short is nothing new for this franchise - they have made the playoffs eight times and been knocked out in the first round five times. They really need to show that they have learned from last year's experience, and they have to do it in the toughest Western Conference we have seen in years. The Wild had a lot of guys they didn't want to lose in the expansion draft - more than they could protect - so they were forced to send young forward Alex Tuch to the Golden Knights in a trade to bribe them to select center Erik Haula instead of another player. The team also sent forward Jason Pominville and defender Marco Scandella to Buffalo for forwards Tyler Ennis and Marcus Foligno in a move more designed to shake things up and change the overall chemistry than anything. Foligno has the most upside in that deal as a big old school power forward with soft hands. 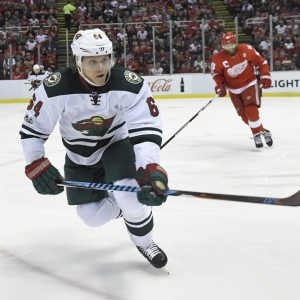 If the Wild can unlock his potential they could win that deal in a big way. The team didn't have much success from the acquisition of Martin Hanzal at the trade deadline, and they didn't keep him around. He left for Dallas - probably for a bit too much money. They also let role players like Darcy Kuemper and Nate Prosser move on. Their free agent acquisitions were depth guys, too. Kyle Quincey is a guy with a bit of upside, Ryan Murphy was a defenseman who underwhelmed but was due for a change of scenery from Carolina, and Matt Cullen is an interesting veteran addition who knows how to win - he won a Cup in Carolina, and two more in Pittsburgh the last two years. The team didn't pick until late in the third round of the draft, so immediate help isn't coming for that front this year. This team has some age concerns. Guys like Mikael Granlund, Nino Niederreiter, and Charlie Coyle are young core players. But Mikko Koivu is 34, Zach Parise is 33, and Eric Staal and Ryan Suter are both 32. All four are at the age where they could easily see their production fall off. To contend with the best of the West the team can't really afford that. There is young talent continuing to come along, though, and centers Joel Eriksson Ek and Luke Kunin and defenseman Gustav Olofsson will all have a chance to make some noise. They also need to find a way to get Devan Dubnyk some relief. He was very good in the playoffs last year, but he has had to play at least 65 games in each of his two years in Minnesota. Ideally he would play closer to 55, but it remains to be seen if they have a backup who can help. It's all about playoff success, and they are a team with the ingredients to finally win two series. The problem, though, is that only two teams in the West will win more than two series, and there are probably nine or 10 teams that could be good enough to do so. The team should be as good as last year more or less, but is that going to be good enough? The team opens with five of six games on the road, including their first three. Assuming they get through that, though, they are rewarded with six straight at home. Both stretches of games will tell us where this team is at and what we can realistically expect from them. Bovada has Minnesota at +1800 to win the Stanley Cup, which has them tied with the Rangers and behind nine other teams. In a head-to-head matchup I would take Minnesota over the Rangers without hesitation, so there is at least some relative value there. BetOnline has the Wild at +800 to win the Western Conference, which makes them the sixth choice. They are tied with Dallas at +375 to win the Central, just behind Chicago and Nashville at +350. What a brutally tough division. The season win total sits at 46.5. They won 49 games last year. The Wild are much like the team they were last year. I'm not convinced they have improved, though, and that's a concern. Dallas is dramatically better, Chicago has retooled, Edmonton and Calgary are both better, and Nashville has last year's experience to draw on. I'm not sure that holding their ground is good enough, so I expect the team to take a small step back. They will be a playoff team, though.